On the occasion of the Turin's Book's Fair, held in May, Daniele Alfonso gave us some news about the "artistic divorce" between Berardi and Milazzo (see article - in Italian...). We add to them other ones coming, indirectly, from Brazil, to mark the point of the situation. In January 1998, at the publishing of the fourth Special Issue of Ken Parker, "Faccia di rame" ("Copper face"), subject and adaptation by Giancarlo Berardi and drawings by Ivo Milazzo and Luca Vannini, the readers comes to know that that issue puts the end to one of the most important italian comics series. Many of them, still today, doesn't believe in a true end and prefer instead to think it as the umpteen interruption of the publish. It was moreover difficult to understand the reasons that leds the ingenious couple to the breaking-off, just them that had worked together for more than twenty years. Specialized press dealt the case as a real "artistic divorce", neither failed speculations and every kind of versions, trying to find the real reasons of this "breaking-off". A detail, above all, had misled readers and reporters, that is the fact to appear separately to the comics related events. Really, according to the more "optimistic" version, it was only a coincidence of the fate, since Berardi and Milazzo were given new - but distinct - tasks inside Sergio Bonelli Editore. Berardi bound himself full-time on his new creation, Julia. As read in a recent interview of him to the brazilian newspaper "Estado de São Paulo", Berardi states that "Julia is the only project on which I am working, and couldn't be otherwise, because it takes up twelve hours a day in average for five days a week to me. A heavy pace that I hope I can slacken with the passing of the time and the strenghtening of the series". As for him, Milazzo was dealing with the thirteenth Texone ("Giant Tex), a great responsibility work because of the importance of the publication, whose "guests" are always top-level artists. He had, also, engaged himself on "Shado", an adventure of the recent Magico Vento series. Long Rifle's fans, in the meantime, asked themselves what could have been the occasion to see again the famous couple together, but, apparently, hopeless. Perhaps because they didn't knew that in Rapallo, on last year's october the 28th, this meeting have really been :-) thanks to a lucky concomitance of details… Rapallo, actually, is near both to Genoa (from where comes Berardi), and to Chiavari (Milazzo): and in Rapallo there is the Ristorante U Giancu restaurant managed by the nice keen Fausto Oneto (formerly mentioned on uBC's pages). And what have been the excuse for that meeting, in the presence of brazilian publisher Wagner Augusto of CLUQ? Well, more than one: first of all the official launch of the brazilian Ken Parker's "miniseries" ("Onde morrem os titãs", 1000 numbered specimens) and also the official award to the two authors of the HQMix trophys, that is the greatest comics related award in Brazil. The "degree" waits to be awarded since 1994, and even for three categories: illustrator, adventure's book and graphic project, all of them for the special issue by Editora Ensaio published that year, with the stories "Cuccioli" ("Puppies") and "Un alito di ghiaccio" ("An ice's breeze"). The trophys were bestowed to Wagner Augusto in 1995, during the official ceremonies of HQMix, since he represented the authors in that occasion. There is, now, the need of an axplanation: the conferring of the due awards to the right entitled of, in the case of international authors (international as regards to Brazil, of course), it is an almost new occasion, as because usually the trophys comes to the foreign authors' delegates or publishers, which makes of them a fetish - oh yes, what fan wouldn't be pleased to hold for himself a trophy which, instead, would have been bestowed to his great idol? Years before, in 1988, Ken Parker was awarded as the Best Far-West magazine of the Year, but the authors never get the trophy, in fact they knew to have won it only in recent times :-) (and actually, in the last eleven years of the HQMix Award not much have been the European authors which really gets their trophy…). Brought the aside to a close, as a confirmation of the merry atmosphere in which Berardi and Milazzo received the awards, here it is a photo - shot by Rosana van Langendonck, "official" photographer of CLUQ and Wagner's wife as well - which collect together the protagonists of the soirée, Berardi and Milazzo, with Wagner and Oneto, in an atmosphere of friendship, joy and heartiness. 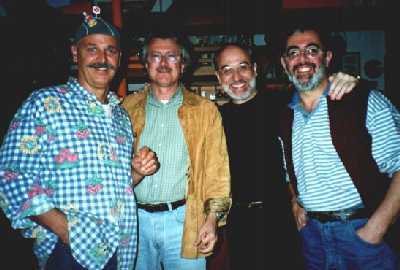 To finish, last news about awards, on 07/19/2000, on the occasion of the twelfth edition of HQMix Award - The best of 1999, there are three awards to be mentioned among many: Foreign Graphic Novel ("Tex, l'uomo di Atlanta", by Editora Mythos), Foreign Miniseries ("Ken Parker, Dove muoiono i titani", by Editora CLUQ) and Comics development (CLUQ, again). The trophys has been bestowed on the 26th of september at the São Pedro Theatre, in the town of São Paulo. An other chance to see Berardi and Milazzo together again, even in Brazil? Well, this time the dream remained a dream :-) and once more fell to Wagner to represent the two authors and to receive the award appointed to them. Berardi did comment so the news about this new award: "Dear Wagner, I am happy for this recognition; happy above all because it gives a prize to your perseverance, your confidence and your boldness! When you'll collect it, I beg you to signify my liking and my fondness to our Brazilian readers".